This is a "blood, sweat and tears" talk with our readers — with apologies to the late Winston Churchill. At Britain's darkest hour of World War II, Prime Minister Churchill's "blood, sweat and tears" speech saved the nation. I t struck through to the hearts of the British people. It moved their emotions. Like an electric shock it gave them hope. It stirred their determination, aroused a willingness to suffer any sacrifice or privation, that their country might survive. Today, as surely as Britain faced the question of survival then, all humanity faces the question of SURVIVAL now — the survival of the human race! We don't like to think about it. We shrink from facing up to the facts. I know that well! But there is a story to be told about that, and I propose to tell it now. Fifty-one years ago a tiny handful of financially poor but sober people did face up to it. They volunteered to join me in a "blood, sweat and tears" sacrifice to do something about it. As time went on, others caught the vision, volunteered to join with them. Now, in humanity's darkest hour — with most of humanity lethargically refusing to face up to it — our deliverance is near. Glorious victory is in sight; humanity will be saved alive. The peaceful, happy, prosperous, joyful WORLD TOMORROW is soon to dawn. Their unselfish sacrifice has gone too long unnoticed. I feel it is high time that I give full acknowledgment and pay full tribute to those to whom tribute is due. They have made possible a very remarkable thing — something never done before! It is something that concerns every reader of this magazine. This magazine now has a vast readership of nearly two million people. Before this vast audience I want now to give public recognition for the loving service, often at great personal sacrifice, given by a comparatively small army of volunteers. They have made it possible for YOU to hold this fine—· quality magazine in your hands just now. They have also done far more. These are the loyal co-workers who have made possible the world's most powerful, most—listened— to broadcast — The World Tomorrow. This program, 51 years on radio, and now on television in nations around the world, has a weekly audience of multiple millions. These same self-sacrificing volunteers have made possible Ambassador College, with its two campuses of tone and character. People often ask: "How can you do it? How can you publish such quality magazines of such tremendous circulation, without advertising revenue, and without subscription price?" When I say you cannot pay for your own subscription — it has already been paid — I do so because I do not like to use the word free. In the strictest sense nothing is free. That is why we say, "Your subscription price has been paid." Of course, SOMEONE had to pay for it. Yet we never charge YOU — the reader. You CANNOT pay for your own. Our mail-opening staff is instructed to return your money if you try. This fact bewilders people. NO ONE ever did anything this way before. Do we then, some ask, refuse to accept contributions? The frank answer is NO! But we DO refuse to ask the public for contributions. That tiny little family of volunteer co-workers has grown through the years. And candidly I do tell them about financial needs. BUT — WE EMPHAT1CALLY DO REFUSE TO SOLICIT OR REQUEST PEOPLE TO BECOME CO-WORKERS. Our expanding family of co-workers became so VOLUNTARILY. SO I repeat — though no one, even a co-worker, can pay for his own subscription to this magazine, it did cost something to produce and put into readers' hands. Your subscription price HAS BEEN PAID — by these co-workers who became co-workers VOLUNTARILY, by their own choice! Their tithes and freewill offerings make possible an astonishing activity serving and helping multiple millions of people all around the world! Let me be really personal, and tell you how this month's "Personal" talk came with such impact to my mind. I was taking an important businessman on a tour of our Pasadena campus. He seemed quite impressed with everything. People usually are. He said, "Mr. Armstrong, you have done wonders!" I tried to tell him I had done nothing of the sort. But I couldn't convince him. All he could see was simply that I had accomplished it. The unseen hands that made it possible were not visible to his eyes. Too many people have been giving me credit for accomplishment over entirely too long a time. So it flashed to my mind that I must make this public acknowledgment, and give this public recognition where it is due. No — not just due — far too long overdue! Some time ago a leading newsmagazine made a statement to the general effect that our only hope for the survival of human life now lies in the power of "a strong hand from someplace." That is 100 percent true. But very few realize it. You see, they were talking about an UNSEEN hand from someplace. What people cannot see, they usually cannot believe. People see me, and give me all the credit. Fifty-eight years ago, my eyes were opened to a good many serious, sobering things. I saw the way humanity is drifting. I saw, even then, the threat to human existence. I read advance news reports, proved to be reliable, of the world 's condition and trends. I read also of the coming SOLUTION of world problems, by and through this unseen strong hand from someplace. I came to "SEE" this "unseen hand." And I was given to "SEE" the challenge to awaken millions to the urgency of the world crisis — and to the glorious GOOD NEWS of the happier world of peace just beyond. This small number of personal acquaintances were poor in this world's goods, but rich in the true values. In a sense, they, with me, felt "drafted" into this service — yet they willingly VOLUNTEERED. That was some 51 years ago, early 1934. 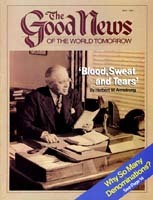 Seven years before, early 1927, I had envisioned the idea of the Plain Truth magazine. At the time, I was living in Portland, Ore. I even engaged a professional letter—artist to design a dummy front cover for a magazine called The Plain Truth. I wrote three or four articles — never actually published, I believe, save one. But it was not until seven years later that I was able to produce Volume I, Number 1 of The Plain Truth. That was the February, 1934, issue. It was a "homemade magazine" done on a borrowed mimeograph. The stencils were cut on a borrowed typewriter. On January 6, 1934, due to the volunteered help of these few coworkers, I was able to go on the air with what became the World Tomorrow program. It was a little 100-watt radio station in Eugene, Ore. The charge for time — $2.50 per half-hour program. The station owner had set a price lower than his operating cost for the half hour. Our tiny handful of co-workers were able, then, to contribute only about $1.38 per week between them. I plunged ahead, taking the. rest on faith. The program then was only once a week. On the first four broadcasts, I offered The Plain Truth, free, subscription already paid. How paid? By these few volunteer co-workers. But we had a MISSION! There was a tremendous PURPOSE! We were sure we saw THE WAY to do it — no set subscription price for The Plain Truth — no request for contributions over the air. All had to be given WITHOUT PRICE! In those early years, this work faced a constant struggle for survival. But gradually it grew — and grew — and multiplied in power and scope. By 1942 we were being heard nationally in the United States. In 1947 Ambassador College was born. But not without birth pangs. For two years it was a fight for existence. Then a few people volunteered to send in their life savings to help. Those people prospered financially thereafter. Gradually, as more and more people have come to recognize the challenge — to realize this great work offers them an opportunity to have a part in changing, and in the end actually saving, the world — the number who have volunteered to become co-workers has increased. But there is a rather amazing factor here. Virtually every phase of our operations increased substantially each year — save one factor. That is the number of coworkers who make it possible. It costs money to conduct this work — more money each year. And of course that means the income for the work from these co-workers has increased each year — for we do pay our bills and therefore our financial standing today is quite strong. But — the incredible thing is, the increase in the number of coworkers helping voluntarily with us each year is less than the increase in expenditures. How can we account for an increase each year in tithes and contributions received with only a small increase in the number contributing? The answer is surprising indeed! Those who volunteer to have part in this great work do find that it PA YS — their personal incomes, on the whole, increase! I do not mean in every case — but as a whole! Well, there is that strong hand from someplace. If that unseen hand does not exist, humanity will not survive on earth another 25 years! I know whereof I speak, for no organization on earth has a more knowledgeable grasp and understanding of world conditions, trends and causes than ours. We know where this confused world is heading. It is simply NOT finding any workable solutions for its major problems. But there is that unseen STRONG HAND! There will be supernatural intervention to save humanity alive. And the revelation given mankind by the Supreme Personage that wields that strong hand explains WHY such a small increase in supporting co-workers can account for the large Increases in what they provide. Listen to a few excerpts from the revealed explanation: To our own nations, He says: "Even from the days of your fathers ye are gone away from mine ordinances, and have not kept them. Return unto me, and I will return unto you, saith the Lord of hosts. But ye said, Wherein shall we return?" And He answers the questioners: "Will a man rob God? Yet ye have robbed me. But ye say, Wherein have we robbed thee? In tithes and offerings. Ye are cursed with a curse: for ye have robbed me, even this whole nation. Bring ye all the tithes into the storehouse, that there may be meat in mine house, and PROVE ME NOW HEREWITH, saith the Lord of hosts, if I will not open you the windows of heaven, AND POUR YOU OUT A BLESSlNG, that there shall not be room enough to receive it" (Malachi 3:7-10, Authorized Version). Our Creator and Ruler of the universe CHALLENGES us to PROVE HIM — He makes a promise! He says put Him to the test! He PROMISES to prosper those who tithe to His work. Again, Jesus' words: "GIVE, and it will be given to you: good measure, pressed down, shaken together, and running over" (Luke 6:38). And further, the apostle Paul: "He who sows sparingly will also reap sparingly, and he who sows bountifully will also reap bountifully. So let each one give as he purposes in his heart, not grudgingly or of necessity; for God loves a cheerful giver. And God is able to make all grace abound toward you, that you, always having all sufficiency in all things, have an abundance for every good work" (II Corinthians 9:6-8). We have been called to proclaim to the world, as a witness, THE FACT that the Creator IS ALSO THE RULER OVER HIS CREA TION — that humanity as a whole has transgressed His laws and therefore brought on itself all the accumulated evils that now exist in this world. We have been assigned to proclaim the very IMMINENT coming of the great Messiah in TOTAL supernatural POWER and GLORY to set up THE GOVERNMENT OF GOD over all nations, and to bring this unhappy world PEACE at last! For the whole truth is, that "unseen strong hand" is, literally, the living Jesus Christ who gave His life's blood to pay the penalty of the transgressions of the world, and who was raised from the dead — and is alive, in POWER, eternally. It is HE who guides and directs this great work. Of that fact, we who know the facts have seen so much evidence over the years that it is no longer a question. And this same Jesus, during His human lifetime, said of His disciples, "You did not choose Me, but I chose you" (John 15: 16). In a sense, those having a part in this great work with and under the living Christ have been drafted. But it is not a compulsory draft. Except for a full-time special mission, each individual makes his own decision. "And whoever desires, let him take the water of life freely" (Revelation 22:17). Therefore, our co-workers, of their own free will, made their own decision, unasked, unsolicited, by me or any in this work. Even though called and chosen by that unseen strong hand, which they may not have realized, they did volunteer to accept, to have a part in changing and saving the world, under the living Christ! We know that we are merely poor human instruments in the work of the almighty God, preparing the WAY! Even now, this work is changing the lives of thousands every year. Soon, under the world-ruling government of God, it will finally result in not only CHANGING THE WORLD, but also in SAVING THE WORLD! And THAT is why this work had to start so small! Whatever God does through humans must start the very smallest, and then grow BIG! THAT is why it has grown so surely and steadily to worldwide impact and power! THAT is why a relatively small annual increase of co-workers have been prospered so that their contributions have increased so enormously! It was truly a "blood, sweat and tears" struggle in the early years. It still is, today. But willingness of co-workers to suffer sacrifice was rewarded not only financially, but spiritually, socially and in other ways. I cannot, in this "Personal" article, give acknowledgment and credit by naming those I wish to honor. They have grown from a mere dozen into thousands. Only a tiny percentage of those who enjoy reading The Plain Truth pay the entire production cost. And they do far more — they finance the World Tomorrow program — they pay the operating costs of the campuses of Ambassador College and all the other GOOD THINGS being done through this work. This work, worldwide though it has grown, has never been able to quit struggling for survival. It still is a daily struggle that the income meet the needs. We have to struggle constantly with the budget. We dare not let it exceed income. We have to struggle to find new ways to make every dollar go further — to give greater SERVICE to larger numbers of people. I have intended this month's "Personal" to be an acknowledgment and a tribute to our coworkers. At the same time I have meant it to be a frank, yet simple and straightforward EXPLANATION to all other Good News readers. It is NOT intended as a solicitation. We want NO, ONE to feel obligated. Rather, that YOU favor US, and we are indebted to YOU, when you allow us to give and to serve. For then ours is the greater blessing, for Jesus said, "It is more blessed to GIVE than to receive" (Acts 20:35). Yet to say that we would not welcome other volunteers who wish to have a part with our family of co-workers would be untrue. We would not deny any that privilege, but rejoice in welcoming them with open arms. Paradoxically, as this work struggles to survive — and to GROW in scope and power — it does so to WARN a world whose greatest problem is SURVIVAL — yet we are the only voice on earth with the GOOD NEWS of HOW THIS WORLD WILL SURVIVE — AND OF THE HAPPY WORLD TOMORROW! Our co-workers and I THANK YOU for allowing us to serve and GIVE!